Hearing, sight, touch, taste, and smell are the five basic senses that link animals and humans to their habitat. In particular, smell, or olfaction, endows animals and people with the ability to detect and distinguish different scents through volatile odorant compounds and, thus, provides a crucial ability to recognize food or evade predators. The five senses have been studied extensively and are believed to be well characterized, but remarkably the fundamental mechanism of olfaction is still debated. 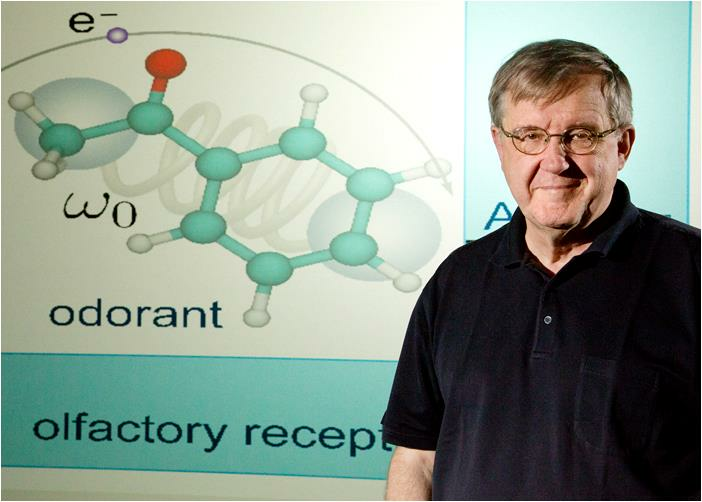 The mainstream explanation of smell is based on recognition of the odorant molecules through characteristics of their surface, e.g., shape, but certain experiments suggest that such recognition is complemented by recognition of vibrational modes. A new study lends support to the latter suggestion, an olfactory receptor is activated by electron transfer assisted through odorant vibrational excitation. The hundreds to thousands of different olfactory receptors in an animal recognize odorants over a discriminant landscape with surface properties and vibrational frequencies as the two major dimensions. The analysis revealed a range of physical characteristics which olfactory receptors and odorants must obey for the vibrationally assisted electron transfer mechanism to function. Many who study olfaction maintain that an odorant's shape and surface are the only things that impact how it smells, but now biological physicists Ilia Solov'yov (Beckman Fellow), Po-Yao Chang (Physics graduate student) and Klaus Schulten (Physics faculty) find via studying fruit flies that a molecule's vibrational frequency can also impact the sense of smell. The study is described by a University of Illinois press release and in a video.